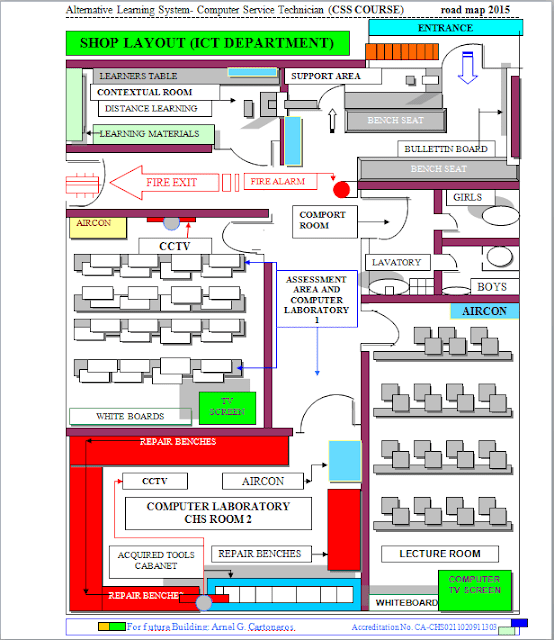 In this post, I create a shop layout of our ICT Computer System Servicing (CSS) department with complete equipment. That will be used for the training of Tesda Accredited course, like the CSS-NCII. This shop layout will be exactly for your project. Or this post will be your reference how to create a shop layout using the Autoshapes of Microsoft Office Word either 2007 or 2010 versions. Airconditioning Lecture room with TV screen for presentation. Airconditioning Computer Laboratory 1- This will be use of actual and assessment area with CCTV and TV Screen. Airconditioning Computer Laboratory 2- This will be use of actual for repair and dismantling computer parts. This room is complete with tools for repair inside a cabinet arranged accordingly. This room also has CCTV for monitoring and repair benches. Comport Room- Separated room for female and male Students with lavatory. Learning Materials- This room serves as a mini library or contextual room serves as distance learning. Support Area- This will be used for the teachers and assessors corner, where learners can ask what they need or support. Fire Exit- Act as the most important part, where it is use for emergency. The fire alarm system is installed in this area. This is very simple application, it's only required basic skill in computer and skills of drawing. Open page setup for your margin, be sure the orientation is portrait. Then use the insert menu at the top, then click autoshapes menu button. Then in the drop down list click your autoshapes you need for the layout. In my work I used basic shapes and lines. Then put and use the shapes you selected in the document template. Use shading colors under the home menu and formats in putting a color of your design. Autoshapes of Microsoft Office Word is a big help of planning a layout. Not only for a classroom design, but actually of any design you need for your project. This is not a correlation, but a perfect use in planning before building in actual your projects.